Groups get stuck when the great idea we started with just dries up. Or, maybe we’ve made a half-hearted effort because we were afraid the groups wouldn’t materialize. Then, we ended up with a self-fulfilling prophecy. In coaching churches over the last 11 years, I’ve seen nearly identical churches in very similar circumstances end up with very different results with their groups. For some churches, their groups take off like a rocket. 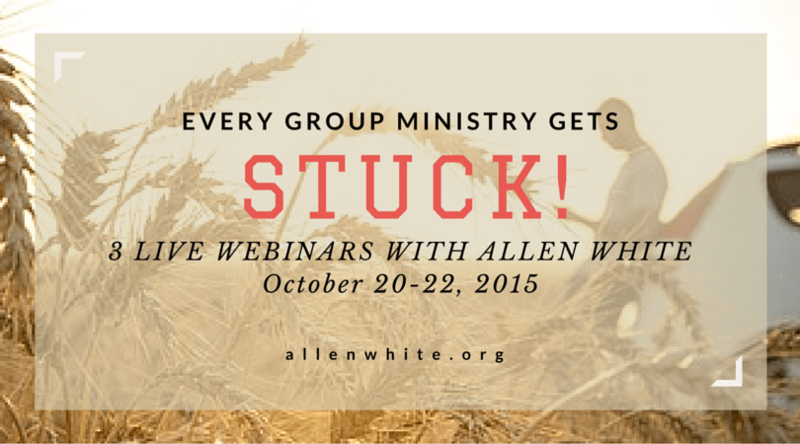 For other churches, their groups get stuck. But, even how they get stuck varies. Some churches get stuck right out the gate. The groups just don’t take off. Other churches are very successful at first. They connect 30-50% of their congregations, then the growth just stops. They are doing exactly what they were doing before, but it’s like the well just dried up. But, then there are those churches who start well, then blow past every milestone: 30%, 50%, 66%, 100%. Does God just like those churches better? I don’t think so. But, what are they doing that’s continuing to build momentum that others are not. As I mentioned, I have coached churches over the last 11 years from all regions of North America, a wide range of denominations from Episcopal to Vineyard churches (they consented to be listed as the extremes), urban, rural and suburban churches as well as White churches, African American churches, Hispanic churches, and churches who have a broad spectrum of folks. Some have shown great success. Others just did okay, then got stuck. What made the difference? In the Stuck! webinar, I will give you the principles for gaining or regaining momentum in your groups. I will show you how a church of 50 people in Dallas, PA connected 100 people into groups, and how a church of 2,500 in Renton, WA now has 500 groups!